Just as awesome as the others, dude. I don't know how you do it. Grape's pouty face just makes me laugh. Nice to see Peanut and Fox hitting it off so well. Grape meets Max. That will be epic! And, wow! Bill being happy? i thought that happened only when he ate RAW STEAK! You have a good concept for a story. We don't know how Peanut and Grape's first day in Babylon Gardens looked like and your point of view is interesting. Exactly. From what I've seen from comic strips, Bill is a kind of a person who is grumpy, overzealous and is suspicious towards others. Here we have him cheerful and friendly. Or maybe you've planned this? Hold on, gimme a second. Gee... what happened to me? I remember when I was really cold hearted... NOW LOOK AT ME! Housepets! changed me...WTF?! Will my head explode because the cuteness? I love the fanfic, Coatl. Max's tentative question was met with stony silence by the purple cat sitting on the floor across from him. He shifted uncomfortably, spent a few moments scrutinizing his claws, then leaned back with a sigh. The other cat looked up and narrowed his eyes. His? Max thought. I think it's “his”. “I didn't,” the purple cat spat. The purple cat groaned, slapping a paw to his forehead. Yep. “His”. Male. Almost sure of it. I think. Silence fell for almost a minute. Finally, after what seemed like an eternity of awkward fidgeting, Max decided to try a new tactic. “What do you think of Babylon Gardens?” Grape shrugged with disinterest, turning to look out the window. Well, Max thought. This whole conversation, and I use that term lightly, is just one long awkward moment, isn't it? Jeff and Officer Bill had said that the cat was having a tough time moving in, and that he was supposed to help him out somehow, but what could he do? He was hopeless when it came to dealing with the emotionally distressed. Well, unless bugging someone until you could almost see the smoke coming out of their ears could be considered “dealing with” them, in which case he was an old pro. If I could get him talking, this would be a heck of a lot easier. Max let his eyes wander around the room, looking for anything that could advance the conversation beyond glares and stammering queries. Then, sitting on a shelf to his left, Max found what he was looking for. He got up and crossed over to the shelf, plucking a mid-sized paperback book off of it. He tucked it under his arm and walked over to Grape, who was now looking at him with more curiosity than contempt. Max held out the book for Grape to see. Emblazoned on the cover is gold block letters was the title “Hunters of the Pridelands.” Below the words, there stood a spear-bearing lion in tribal gear. The sun was beginning to set behind him, and the last red rays seemed to catch the tall grasses aflame. Grape raised an eyebrow. “Could I take a look at that?” Max shrugged and handed over the book. Max shrugged. “Sure.” Aaaand consider the ice broken. I am so smart. Max paused for a moment, then rolled his eyes. Great. Now I'm starting to sound like Bino. “Well, Max, I think I'd better head home now. Thanks for everything.” Grape got up and started for the door. “Of course. See you around, Max.” And with that, Grape walked out the door and down the hall. Well, Max thought with the barest hint of a smile crossing his face. That went rather better than I thought it would. He glanced around the now-empty room. Well, I'm bored. I wonder where Bino is...? As Grape walked down the sidewalk back to her new home, the sun's position in the sky was rapidly coming to mirror the cover of the book she held tucked under her arm. The red orb set the sky aflame just above the treetops, turning nearby clouds into blazing orange and yellow bursts. It wasn't long before she finished the short walk back home. The first thing she noticed was Peanut, sitting with a book on the steps in front of the door. Grape looked at him with her head tilted to one side. Grape nodded. “Yeah, Max. He lent me this book.” She held up the paper back so that Peanut could see it. The pair sat in silence for a while, watching as the red light of the sun began to finally sink behind the trees and extinguish itself. The fiery reds in the sky began to make their subtle shift to deep purples and blues. Long shadows stretched themselves still further down the empty street. With a cacophony of shouts and laughter, the two dashed through the open door and down the hall. Well, it's happened again, you've wasted another perfectly good hour listening to Car Talk reading my fanfiction. As the beginning of the post said, this is indeed the last entry (aka The Conclusion. Underline required.) I had actually planned on wrapping things up long before this. My original plan was to sort of say "and the rest is history" after Peanut and Grape got adopted. But at some point I guess I said "why not?" and kept going. Anyway, this isn't it for this thread. I've still got a couple of short, stand-alone things that I plan on writing and posting here. So, stay tuned. Cool! I guess that's an interesting way for those two to meet. DDDAAAAWWWWWW The epic cuteness is gonna grant me 100 extra years of life. Woot! That was relaxing to read... too much presure in school. Thanks and you did a great description of the sunset. Nice ending there Coatl-Ruu! Especially sneaking in The Pridelands book series! Can't wait for your next story! Channel Surfing: The basic idea for this was spawned from me geeking out about some of the potential ways the Housepets world might be different from our own. I thought a good way to demonstrate that would be to have a short story with a couple of characters watching TV - namely, news, commercials, reality shows, and other various programming. I couldn't think of a way to do this that wouldn't be incredibly dull. Then I saw this page. And I knew what had to be done. The Dogs of War: (alternate title: Let Loose the Dogs of War). This one is actually going to be more on the serious side (and, just to give y'all a heads up, more on the "PG-13, potential violence ahead" side). It follows Private Duke Walters, a German Shepherd who's just been deployed in Afganistan as a part of the United States Military Animals Program. Recursion: Actually... I think I'll hold off on describing this one for now. Suffice to say, it should be... interesting. Well. I clearly have a lot of work to do. Adios for now, folks! Last edited by Coatl_Ruu on Thu Feb 24, 2011 9:12 pm, edited 1 time in total. wow! Very interesting ideas, can't wait to read each one of them. Pretty much what Val said, but about the Channel surfing one, I am expecting close ripoffs of products we know. The Dogs of War! we need more War and less love... but all your ideas are good! Alright! Channel Surfing is completed. It didn't turn out quite like I'd hoped, but if nothing else the ending makes it all worth it. “Hey!” Jeff roared in a voice that seemed to shake the entire room. Max and Bino's protests and accusations almost immediately trailed off into silence, and they looked up with widened eyes at the livid face staring down at them. “Okay,” Jeff spat tersely. “Let's try something. The power came back on about fifteen minutes ago. You guys still want to watch TV?” Max and Bino exchanged glances, then nodded hesitantly and without speaking. Jeff's mouth twisted into a thin smile. “Glad to hear it.” Without warning, he grabbed Bino just below his shoulders, hauled him into the air, and placed him roughly down on the left side of the couch. “There are three cushions. Bino, the one on the left is yours.” Then he grabbed at Max. “Hey-” But before that cat could protest, he too was sprawled out on the sofa. “Max, you've got the right.” He placed the remote down on the unoccupied middle. “This is the demilitarized zone.” He stood back and glared at the pair. “Now, here's how this is going to work: you two will take turns using the remote to change the channel. The remote is to be left in the demilitarized zone when it's not in use. The only time you are to enter the demilitarized zone is to retrieve the remote when it is your turn to change the channel. “Yes, Dad,” Max and Bino droned in unison. “Good. I'll see you two when your time is up.” Jeff turned to leave the room. The instant his back was turned, Max leaned into the “demilitarized zone” and snatched up the remote, sticking his tongue out at Bino. “Hey!” Bino lunged for the control, but Max yanked it just out of his reach. “Bino goes first,” Jeff said, without turning around, just before he walked out of the room. Max's sneer dissolved into an icy glare, and he grudgingly held out the remote control for Bino. The dog snatched it up, leaned back onto the couch, clicked the power button, and flipped to a random channel. “Breaking news: snow.” Max rolled his eyes. “Who'da thunkit. Gimme that remote.” Bino shrugged and handed it off to Max. “Can't argue with that.” Max was rather more eager to let Bino have the remote this time around. “And that's the word.” A man wearing a black suit, glasses, and a dramatically raised eyebrow points at the screen. “We'll be right back.” A blaring fanfare plays, a graphic flies across the screen, and the show goes to a commercial break. A series of advertisements flash across the screen. “Great to be here, Stephen,” Keene says, taking a drink from the ferret-sized mug on the table. A sly grin spread across the black cat's face. “No, I think that the remote control likes me better. You see, we're quite happy together, it and I, and I don't think-” Max never finished that sentence. Bino flung himself from his seated position into a flying tackle that sent them both tumbling onto the floor. “Ack! Mad dog! Mad dog!” Max stretched his arm out so that the control was still just beyond Bino's grasp. Bino charged. Max looked up and his eyes widened. “Oh poo.” The dog struck him like a freight train, and again they both went tumbling back. But, as was becoming common policy, Bino didn't finish that sentence. He was struck in the side of the head by something green and fluffy. “Eh?” He released Max and plucked the object off of him. A moment later, something similar landed on Max. The pair picked the soft projectiles up and held them out. They were their scarves. “Crud,” they muttered simultaneously. With sinking hearts, Bino and Max looked up. Jeff was standing directly behind them, staring down with a look that could probably have ended both of their lives right then and there, had it been so inclined. “Yes, dad,” Bino and Max droned. They picked up their scarves and trudged off toward the door. With a sigh, Bino took the remote out of his hat and tossed it to Jeff. The man caught it and took a seat directly in the middle of the couch. “Might want to get started. You're burning daylight.” He leaned back in his seat and aimed the remote at the TV. Well that was a nice little story. I can't wait to see what you write next. Technically Max is in the wrong, but oh well. Bino always deserves what he gets. That was really good, me likes! No, thank you for bringing us such wonderful stories! I could've SWORN I commented on this... oh well, nice job on Channel Surfing. I really enjoyed it It reminds me when my brother was mocking me like that. It turned out well I'm looking forward to see more of your stories. EDIT: Also, a shiny new thread title. ...... OH! Sorry. Shiny things tend to distract me. Anyway...What was I saying again? Illustrations sound awesome! Can't wait to see it! *Stares at thread name again* SSSSHHHHHHIIIINNNNNYYYYY! Art? Sounds interesting It will be nice to see it. ...... OH! Sorry. Shiny things tend to distract me. *checks* Why yes, I suppose I am. Just with inferior artwork. Speaking of my artwork of questionable quality, I've got a sketchy sketch to show y'all. (Just try not to look to hard at his left leg. ) 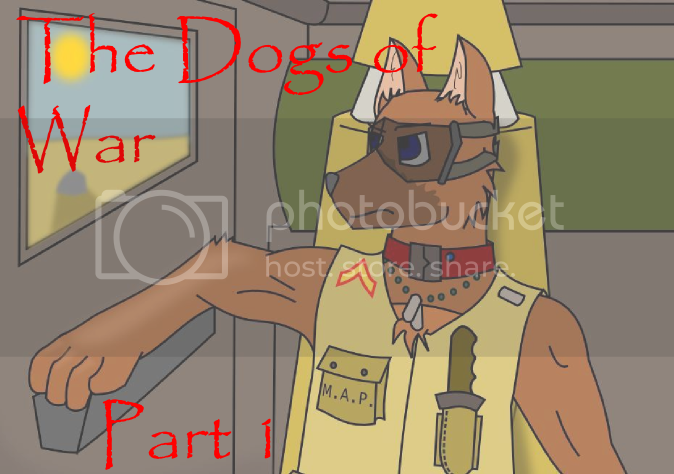 In other news, it'll probably be a few days before I deem part 1 of The Dogs of War ready to be posted. So... bear with me, I suppose. If that's just a sketch, I can't wait to see your real artwork! OOhh! Commando! He looks like he is going to do some damage! And finally, a word of warning *ahem*: The following program story contains material that mat be objectionable to some. Viewer Reader discretion is advised. Or, in a more plain way, this is rated PG-13. Or at least, part 2 will be. Part 1, not so much. But still, there will be violence. I don't think it'll be excessive, but people will get hurt. Don't say I didn't warn ya. And with that, I'll stop rambling and let you guys read. An army caravan rolled along the dusty desert road, a straight line of trucks and armored vehicles in the vast, sun-scorched waste. To the left, right, and back of the line the world was nothing but a stretch of hard-packed road amidst a sea of sand. Ahead, the faint outline of a group of low-set buildings was visible. A few men in combat fatigues, seated in the lead Humvee, were having a discussion with another passenger. Duke narrowed his eyes at the “Rover” jibe. Suppressing a growl, he opened his mouth to respond. Corporal Evanko chuckled softly. “Actually, that might not be as unique of a situation as you'd think. Dogs have been used by armies for thousands of years. A Persian emperor actually deployed armored dogs against Egyptian archers back in like 500 B.C., and-” Corporal Evanko immediately snapped his mouth shut when the dashboard radio let out a short burst of static, followed by a tinny-sounding voice. The German Shepherd grinned, nodding curtly. “Roger that.” He sat up a bit higher, craning his neck to get a better look at the sandy waste around the lumbering armored transport. The faint line of buildings that he'd first seen at least fifteen minutes ago had resolved itself into a wide spread of single-story, dust colored shacks. He could just barely make out a few soldiers standing by the road leading into the village. Off to the side of the road, the sun glanced off a bit of metal buried in the sand. Then, the light caught a thin piece of wire suspended mere inches above the road. The faint smell had grown stronger. Explosives. And they were closing in on it fast. Duke felt as though his body had been electrified. 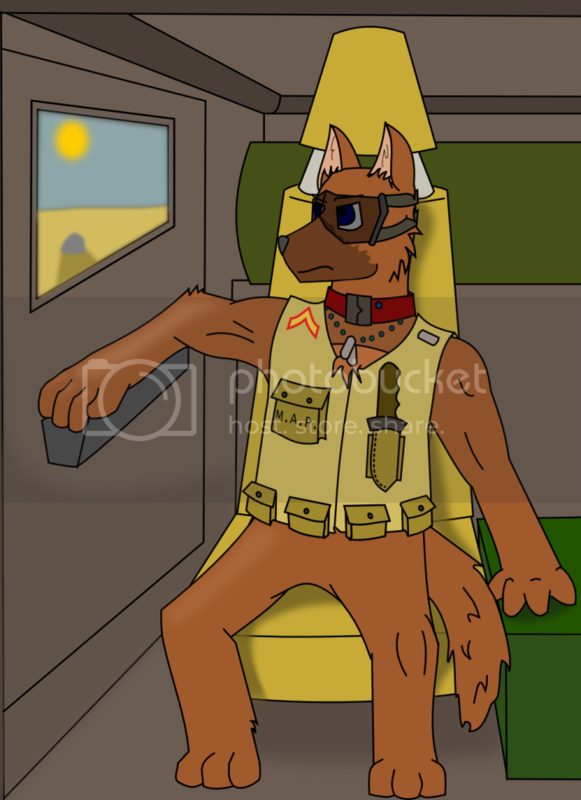 “IED!” he roared, leaping forward in his seat. With a crash of thunder and a flash of pain, the world dropped out from under him. Last edited by Coatl_Ruu on Wed Mar 02, 2011 5:21 pm, edited 1 time in total. Very well written, Coatlruu! I can't wait for the rest of this story. Very nice! I think you made a good job when describing what the military dogs' place was in the army. This part of the canon is kind of unknown for us, at least until Rick finishes the Infinitesimally Brief History, but I think you found a great balance, it's very believable. And I liked the part with Vourlis and Duke! Oh, just wait. You ain't seen nothin' yet. I think you made a good job when describing what the military dogs' place was in the army. This part of the canon is kind of unknown for us, at least until Rick finishes the Infinitesimally Brief History, but I think you found a great balance, it's very believable. That was a big reason I wanted to write this. This is something that the canon hasn't really touched on, so I was free to make crap up draw my own conclusions. Also, it turns out that what I had the military dogs doing actually isn't very far from reality. And the bit about the armored dogs being used against Egyptian archers? Also true. Yeah... Sergeant Anselmo is a good guy, but he must not be the most genre-savvy of the lot. Okay, couple of updates for those of you who care (that's right, all three of you. ) Part two, though almost completed, won't be posted here just yet. I think I may have put a little too much emphasis on the "bloody violence" aspect. So I'll be editing it to that back a couple of notches. There is good news as far as the illustration goes. 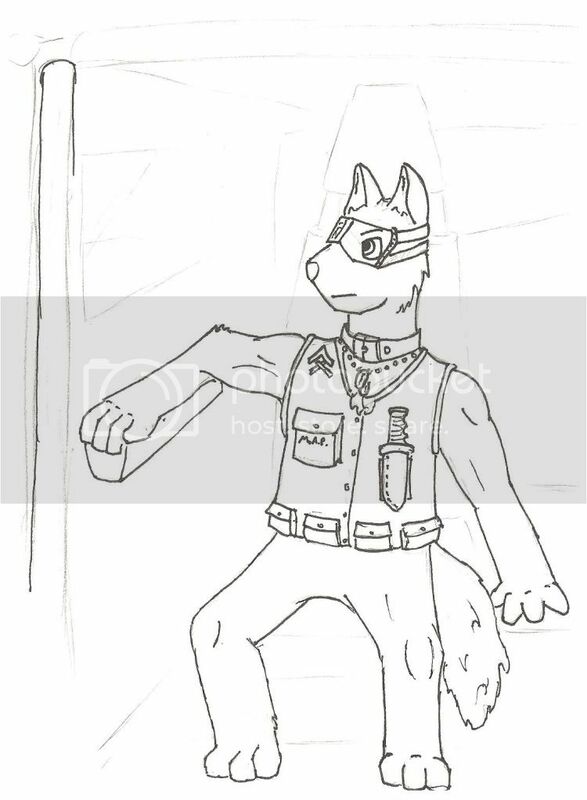 The tablet I ordered should come tomorrow, so I'll be using that for my coloring. If all goes as planned, it'll look halfway decent. Well... that's all I have to say. Adios for now, folks. Well, I can wait. I am full of that thing people call patience. Can't wait for the drawings/ story! And an awesome sketch it is! I wonder how that will play out for our little hero.